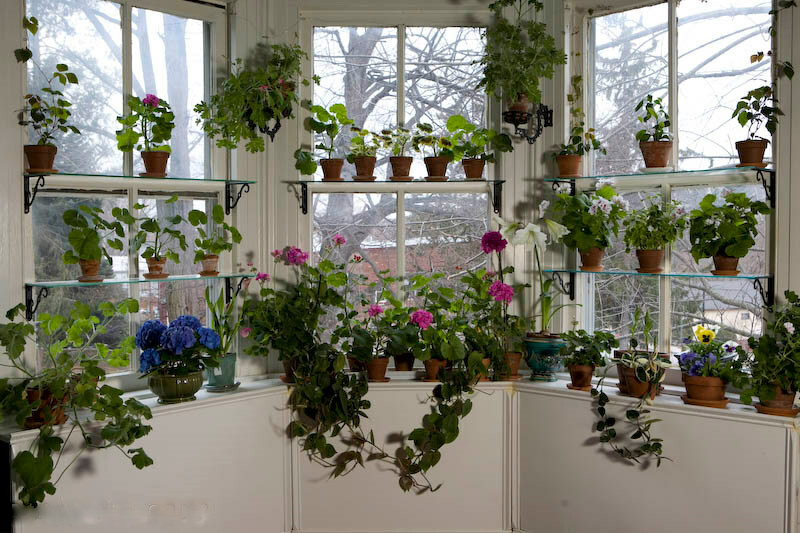 HERE AT A GARDEN FOR THE HOUSE, I rely on window gardens — including the one above, in my den — to chase away the winter blues. You might like to have such a garden in your own home. Of course you’ll need plants. And to help you acquire them, I’ve purchased a $50 gift certificate from Logee’s Greenhouses. Want a chance to win this spending-spree in a random drawing? Above: The enchanting “Blue Sky Flower,” just one of many exotics I’ve purchased by mail-order from Logees, opens its sparkling burdens of blue starting in mid-December. It flourishes for me in an east window. 1. Sign up for my weekly email newsletter (if you haven’t already). It will take you only a moment to subscribe to this newsletter which is completely SPAM-free. 2. Post a comment below, mentioning one or more of your favorite flowering houseplants. Mention also your email address (or just the first part of it). This will not only enable me to verify that you’ve subscribed to my newsletter, but it will make it easy for me to find you should Random.org select your comment as the winning one (I don’t select the winner). 3. Click the Facebook “Like” button below. You can join me on Facebook, too, if you wish. Enter soon! This drawing ends on Saturday, November 12, 2011, at 11:59 PM EDT. I’ll use the little gadget at Random(dot)org to select a winner. So far my houseplants are a window kitchen herb garden and hyacinth and narcissus which I force in winter. But pictures of your window gardens make me want to try more, and I'd love to win the GC! I subscribe to your newsletter and like you on FB. Still cleaning up from last weekends 14″ of snow and all the trees and branches that came down. So many people still don't have power a week later so I feel very lucky. Your contest sounds great ~ I would love a Meyer lemon plant and paperwhites, but the pictures on Logee's website are so beautiful, I would definitely have to give it some thought. Anything pretty and blooming inside right now would be a welcome sitye. I am an email subscriber and my email is in my profile. 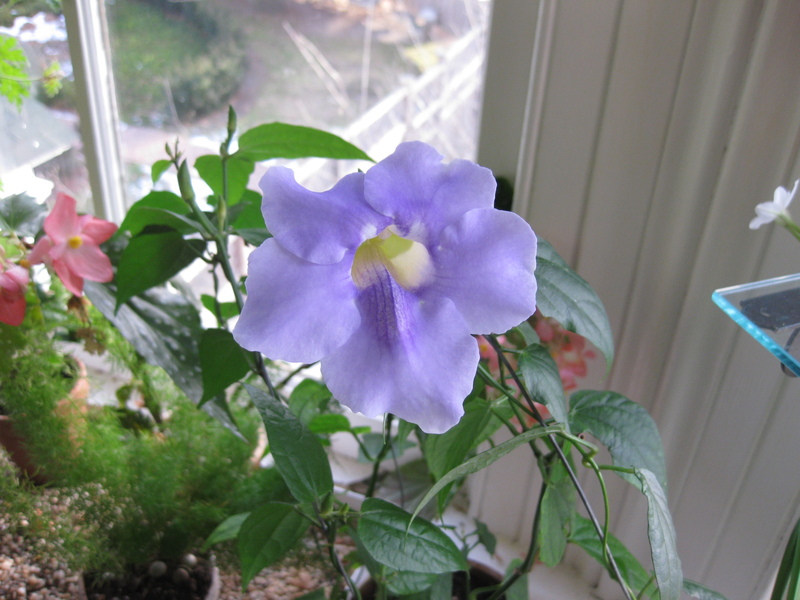 The flowering houseplants that I have now are African violets, a shamrock, a lipstick plant and a Christmas cactus. I'd love to have more, so it would be great to win. Thanks for the giveaway! My favorite houseplants are edible herbs and wheatgrass is a favorite of both cats we have. I like you on Facebook, FB name is Cindy Merrill. Love the window gardens, love your newsletter and facebook, the soup is soooo good! I bring my lavender inside during the winter and it continues to bloom…and smells good too! I also love my lipstick plant and am “stiring awake” my amaryllis bulbs which are displayed up on my piano with a lovely south window. oh, how I would love to have a Christmas Cactus that actually blooms at Christmas. Not in Oct or Nov or Jan (like others I have had before), just on Christmas time. Love Logees and this blog! 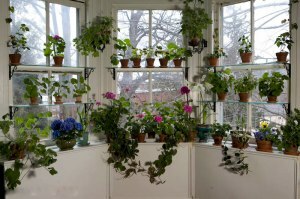 Your window garden is beautiful- my indoor plants definitely help melt the winter blues! I have an angel wing begonia that has been passed on from my grandfather and is at least 50 years old. It gets the most beautiful clusterrs of dark rose flowers. JM Designs – being a landscape designer, I don't have a favorite indoor or outdoor plant, I simply love them all! Does a jade tree count as a house plant? I am a subscriber discriminating_diva at yahoo and I like the post Sherry Conrad. We have a really funky cactus that gets some amazing blooms on it, and I forget what it is called, my daughter has a lucky something or other from Hawaii that blooms for about 3 mos then goes dormant for a while etc. For the most part we don't have a lot of flowering inside, more green, but I love having any type of plants. I made your French Onion Soup and it was delicious! I am going to try the butternut squash soup recipe, too. Your gardens are gorgeous and I absolutely love your newsletter. I also have a Halloween cactus and would love to have any color amaryllis. I dont have any houseplants but I do like the Spider Plant. One of my favorite plants that I also love to keep inside is hyacinths. I like you and the giveaway on FB! Joined your mailing list, and found your FB! To narrow it down to one favorite is very difficult. I guess the front runner would be my Euphobia Milii. The small white flowers are so delicate and cheerful. Since it is such a non stop bloomer, it breaks up some of the winter dull drums around the house long after other plants have stopped blooming. Since I live in Texas all my plants are for the most part outside. we've got a little bit of cold headed this way so my more delicate plants are coming inside. I have 2 Jade Vines and a Queens Tears that I would hate to lose. They are both babies, and I can't wait to see them bloom. Logees has so many plants that I would love to have. I love my ginger, lemons, lime, Christmas cactus, hibiscus, begonias, scented geraniums, and albutilon ! The colors and fragrance get me through the long col winter and make it feel like spring inside! Also love those winter trips to Logees for rejuvenation ! Logee's is a place I go when I get the winter blues. Such a Zen atmoshere. I can never get enough of their plants. Some of my favorite purchases is the Meyers Lemon, Banana, serveral varieties of the Hoya, Lipstick plant, and the ZZ Plant, which is huge now. I have one of those portable greenhouses, which needs to be filled. The only house plants that are currently in the house are various orchids. I used to have many, but they grew, and grew, and GREW. So now I have many tubbed diva plants that I had to devise a greenhouse for. A LARGE one. Many of them (most) started out as small plants that I got from Logee's. My favorite winter garden is a collection of Streptocarpus. I love them so much!!!!! I have 5 bay windows in my home and each one is a collection of streps in a different color pallet. I have had great luck propagating them from cuttings and spend the winter doing so. It is comforting being able to continue to grow things in the dreary winter months! I subscribe to your newsletter and like you on FB. Thank you so much ! I started my collection when I lived in Dayville CT and enjoyed visiting your greenhouse often. Miss that! I am lucky to have a south facing large window, so I have it crowded with hibiscus, passiflora, gardenia, albutilon, epiphylum oxypetalum, just to name a few of the many plants I have purchased from Logees over the years. The trick is keeping them healthy and bug free over the winter! From Ct. and now live just south of Housto.I have many plants/flowers from Logee's. Just installed shelves across my living room,kitchen and bedroom windows and have started cuttings from a number of passion flowers and am hoping they will bloom over the winter as they have all summer,doordog55,Pearland,TX. My lemon tree is my favorite. You not only get great fragrant flowers but the fruit to enjoy also. I don't have much luck with flowering house plants but, I have managed to keep a pretty light purple African Violet going since last winter! I am quite proud of that. I was also amazed a couple years ago when my huge Jade plant was full of flowers one winter. I didn't even know Jades flowered! For over 30 years I have seen “Dorothy” my grandmothers christmas cactus bloom(magenta) starting in November and blooming again in late winter. I remember seeing it bloom in my grandmothers sunporch as far back as I can remember(50+ years). I inherited it 34 years ago and have given away numerous clippings! Long live Dorothy! I live in Florida so my plants are all outside. My favorite plants are the Tahitian red ginger, the Gardenia and Plumeria. Hi, scottish lass here (part of my e-mail address. I used to have over 100 houseplants, including blooming phalaenopsis and cattleya orchids, clivia, bromeliads, African violets, streptocarpus, Christmas cactus. I lost them all in a fire some years ago. I have just started growing plants indoors again (though I am an avid outdoor gardener). I now have 7 orchids (phals and dendrobiums). I love to see my spiderwort in bloom. I also take great pleasure in the blooms of my prayer plant. tjandginny at msn dot com I look forward to reading your updates on your FB page. Glad to know I'm not the only one that loves plants in the winter. I personally love the jungle like feel my house takes on. Especially with a fire going and a blIzzard outside. My favorite houseplant is the kumquat–love the contrasting colors and flavor. I've subscribed and am keeping up with you via fb 🙂 thanks for the giveaway! Just found your blog through Logee's website and it's looking pretty great! My favorite houseplants for winter bloom are the orchids, I've got a few in bloom now and afew more that will be blooming soon. My Christmas Cactus is it's most glorious right now and I'm waiting on my seed grown Clivia plants to come into bloom next Feb. I also keep a light stand in the livingroom for all the seed pots I will be tending when the orders arrive in the winter. I'm an email subscriber, liked this post and your profile on facebook 🙂 I don't really have any experience with plants, but looking at the Logees site, I like the Fire Lily 'Good Hope'! My favorite houseplant is Oxalis. Email subscriber. I'm already subscribed to your newsletter with my gmail email account asthenight. I'd love to get a Tillandsia Ionantha Ball and an Australian Beach Cherry. I clicked the like button (Deborah Rosen). My favorite flowering plant right now is my meyer lemon tree-when it blooms it's absolutely LADEN with blooms that fill the room with their scent. Then, when they start to set fruit, my tiny 18″ tree sets so much fruit it would fall over without the aid of my thinning the crop and the window sill to prop it up. I just made a lemon merangue pie from the fruit so full of my months of loving glances you could taste it's bright sunny thanks. We have several african violets in our house! Email subscriber, vivaci….. I love african violets, but am up for expanding my plant base. Thank you all for entering! Random (dot) org selected the comment # belonging to jane mihalich, who has been notified by email. Stay tuned for next month's giveaway!